Bu SVG dosyasının PNG önizlemesinin boyutu: 800 × 582 piksel. Diğer çözünürlükleri: 320 × 233 piksel | 640 × 465 piksel | 1.024 × 745 piksel | 1.280 × 931 piksel | 821 × 597 piksel. İngilizce, Frontlines during the Battle of Tripoli (20 - 28 Augusts 2011). 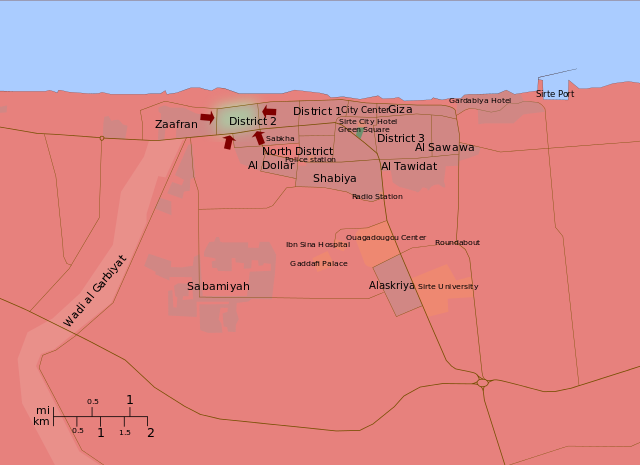 İngilizce, Frontlines during the Battle of Misrata (18 February - 15 May 2011). İspanyolca, Frontlines during the Battle of Misrata (18 February - 15 May 2011). Territories of Gadafi and of the NTC (gif format). There is very little information about this front, and it is not known where the frontilne exactly is.